As you read this, my wife and kids and I are in the midst of a lengthy Christmas trip. We’re visiting friends and family strewn all about the Midwest, and that means lots of hours in the car with two small children. Much like everyone else, we strive to minimize both the time spent in the car and the financial cost of our car trips, and this week is definitely going to give us a chance to try out our tactics. Here are twelve things we’re doing this week to shave some of the cost from our Christmas travel plans. 1. Air up all of the tires before you leave. A day or two before you depart, take your car to the local service station and check the pressure in all of your tires. Don’t know what the pressure should be? Check the sticker inside your door jamb. Make sure all of your tires are filled up to the maximum recommended pressure. Proper tire inflation can save you 3 to 4% on your gas bill during your trip, and over several hundred miles, that can really add up. 2. Get a tune up. If you can’t remember the last time your car received a tune up, get one before you go. A proper tune up is your best insurance that your car will operate in an optimal fashion while traveling, and a tune up from a quality professional can identify any major problems that may interfere with your travel. 3. Prepare an emergency kit. 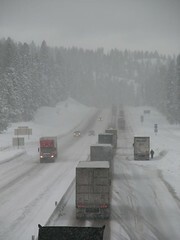 Traveling in winter can be hazardous, and the best way to minimize the risk is to be prepared. Pack some blankets, an extra charged cell phone (for 9-1-1 calls in a pinch), extra clothes, some food, and some road flares in your car and make sure you have a spare tire and equipment for changing it if you need to. 4. Make sure your auto insurance is up to date. A long car trip is not the time to be caught with out-of-date insurance. Make sure your insurance is up to date, and if it’s not, make every effort to get the premium paid so that your insurance is in effect over the course of your trip. 5. Pack food and beverages before each long leg. Tasty and nutritious snacks are always a hit in our car – we like granola, raisins, and dried cranberries for long trips. They’re perfect for taking the edge off of hunger, enabling us to happily survive without hunger pangs until we arrive at our destination. We also pack water bottles to keep us on the road instead of stopping for expensive beverages. 6. Plan for simple entertainment for the kids. Bored children can make a long trip miserable and can often cause you to make unplanned stops along the way just for a break from the noise, which wastes time and often wastes money, too. We usually pack a “trip bag” for our kids – a few familiar toys, some books that my son knows by heart (which he then reads to his sister) – and have some ideas in mind to keep the kids interested, such as pointing out interesting roadside items. 7. Check the maps, even if the trip seems very familiar. Use a mapping tool like Google Maps to plan your trip, even if you’re very familiar with the route. Since moving to my current area just a decade ago, the optimal route to visit my parents has actually changed four times, and now, compared to the original route, the trip takes more than an hour less than it used to. That’s pure savings. 8. Time your trip to avoid obvious traffic issues. If you know you’re going to be driving into a major metropolitan area, try to avoid entering the metro area during morning or evening rush. This can usually be done with some careful planning in advance. Leaving a bit later (and eating at home instead of on the road) can actually end up getting you to your destination just as quickly with a lot less time on the road and a lot less money spent. 9. Eat a homemade meal thirty minutes before you leave. Being purely sedentary right after a meal isn’t particularly healthy, but you should plan your trip so that you’re not hungry along the route (which will almost always result in unintended expenses). We try to leave roughly half an hour after meal time. Quite often, this coerces the children into taking a nap (which, again, makes the trip less expensive as there’s less need to stop) and also keeps the adults from being hungry along the way. 10. Use your cruise control over long stretches. This not only keeps your speed at a steady rate (keeping you from wasting money from accelerating and slowing down over and over again), but it can also keep you at a speed that will ensure you’re not pulled over and issued an expensive speeding ticket. In Iowa, most trips involve long, straight sections of highway, so we utilize our cruise control on almost every trip. 11. When you do stop during the trip, make everyone use the restroom. Trust me, with two young children, bathroom stops are a constant part of any long trip. Every time you stop, though, you lose time and you also lose a bit of money wandering around in a small town searching for a gas station that doesn’t make you afraid to use the toilet. When you do find a gas station, though, have everyone use the restroom. It might take you a bit longer while stopped, but it will keep you from making multiple stops later on, which will save you time and money. 12. If you need food along the way, don’t use fast food. Not only is it unhealthy, it’s often sneakily expensive. Instead, stop at a grocery store. You can get all the supplies you need for an easy meal right there – cold cuts, a loaf of bread, and some finger vegetables can be had for just a few bucks and will feed everyone in the car.